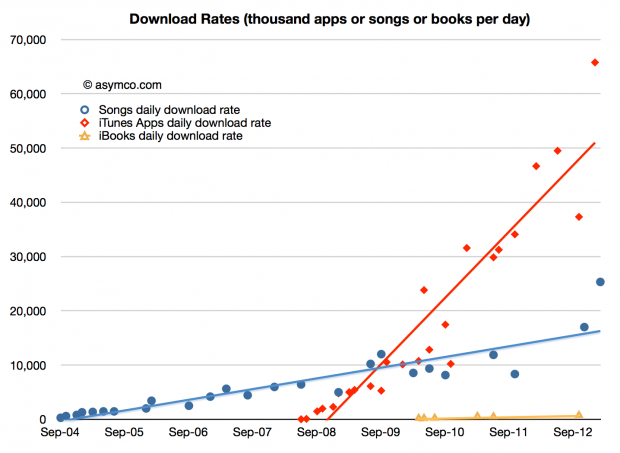 In June of 2011 Apple announced that 130 million ebooks were sold through iTunes. In October of 2012 it announced that 400 million sold. The download rate looks paltry but we need to remember that Apps have a very low average selling price (about 23 cents including in-app purchases) and that Songs are probably priced around $1.1 on average. In contrast each ebook could be generating about $10 per download. However that may be a bit high. We don’t know the mix of lower priced and higher priced books. Many best sellers are $13 or $14 but there might be some free books in the mix as well. If I choose a more conservative $9 average selling price and assuming a 70% share for the publisher then Apple’s iBooks generated about $1.3 billion in payments and grossed about $1.8 billion. 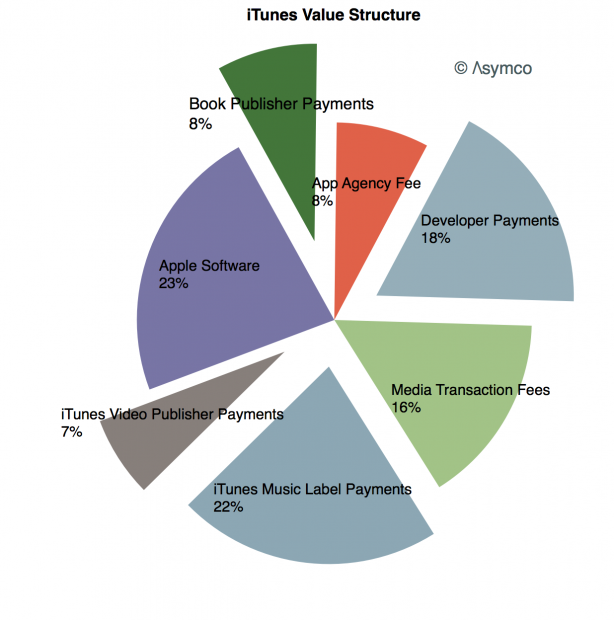 In the past few posts I measured the iTunes App ecosystem and the Music economy. With the iBook market now measured we can derive the size of the only remaining media type: video. I’ve seen one estimate that world-wide ebook unit sales reached 860 million implying Apple’s share was about 24%.